Joyce Arlene Smith, 78, passed away September 3, 2016 at Olathe Hospice House. Funeral Services will be 10:00 am Friday, September 9, 2016 at the Gardner Church of the Nazarene. Burial will follow at Gardner Cemetery. Visitation will be from 7 – 9:00 pm Thursday, September 8, 2016 at Bruce Funeral Home, Gardner, 913-856-7111. Memorial Contributions may be given to the Pathway to Hope Inc., Olathe. Joyce was born February 4, 1938 in Muskegon, MI to Vivian Goldie (Huff) and John Sagner Johnson. She was a graduate of Ravenna High School in MI and earned her Bachelor of Arts degree from CSUDH in 1985. Joyce retired as an accountant having worked for the General and local Nazarene Church. 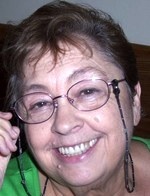 She lived in California from 1966 until 1991 when she moved to Olathe to be with her family. She was a member of the Gardner Church of the Nazarene. Joyce served as church pianist for many churches throughout her life. She was a Lay Counselor and enjoyed mentoring in her church. She will be dearly missed. She was preceded in death by her parents and brother Arnold L Johnson. Joyce is survived by her children: Terrell Wayne Smith and Leora of Olathe, Kevin Lee Smith and Antoinette of San Pedro, CA, and Linda Rae Massei and John of Torrance, CA; eight grandchildren; one great granddaughter; siblings Barbara E Kiefer of Ft. Wayne, IN, Richard E Johnson of LeRoy, MI, and Linda R Weber of Olathe.